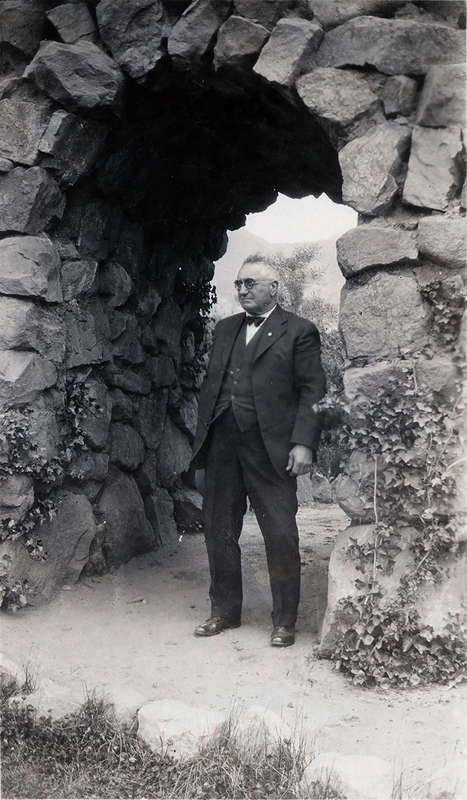 SCVHistory.com SZ2702 | People | William J. Biscailuz, Pico Canyon Petroleum Engineer, ~1900-1920s. Photograph of William J. Biscailuz in the collection of Charles E. Sitzman, the Pico Canyon oil field superintendent from 1927-1937. In an audio recording, Sitzman's daughter Barbara Sitzman Cook said Biscailuz lived at the foot of a hill coming down from Pico. According to researcher Tricia Lemon Putnam, Biscailuz lived and worked in the Newhall-Pico area from at least 1900 to the 1920s. The 1900 U.S. Census for Newhall gives an occupation of tooldresser; in the 1910 U.S. Census for Newhall he's a pumper for the Standard Oil Co.; the 1920 U.S. Census lists him as a gas plant engineer with two sons working in the oil field. That's not his only tie to the Santa Clarita Valley. W.J. Biscailuz of San Fernando met Dolores Cook seven or eight times. He was not acquainted with the people very well in the neighborhood where he resided. He was not allowed to testify as to Cook's reputation. Twenty-seven years later, Biscaluz's son, Valentine (1893-1946), married Mr. Dolores Cook's daughter Dolores (1890-1922), who had been born just one month prior to her father's murder. Half-Native American from the Los Angeles area and half-European (like both of her parents), she was probably born at the family home in Castaic. BROTHER & NEPHEW: William J. Biscailuz was 3 years younger than his brother, Martin V. Biscailuz, who was born in 1861 in France to Basque parents. Martin was a prominent L.A. attorney and member of the Los Angeles Common Council, which disbanded in 1889 to become the Los Angeles City Council. Martin and his wife, Ida Rose Warren, had a son in 1883 — Eugene W. Biscaluz, who formed the California Highway Patrol and became L.A. County's 27th sheriff in 1933. He held the post for 26 years. SZ2702: 9600 dpi jpeg from original photograph in Charles E. Sitzman Collection, courtesy of Stan Walker.